We have Blaine visiting us today from corporate. We had a full day of learning. Thank you for the chocolates! Happy Valentine's Day from all of us! We hope your day is filled with lots of chocolates, family and friends! Love Always. Happy Birthday Gustavo! We wish you many more years to come. 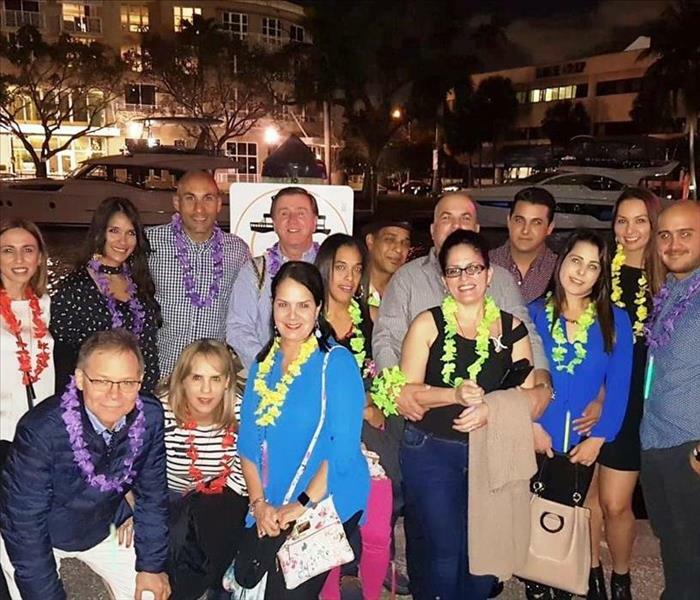 This past weekend the SERVPRO of Sunrise family gathered for dinner to celebrate Christmas. We had a unique tikki themed dinner cruise experience as we cruised along the New River and the Intercoastal waterways of Fort Lauderdale, also called the Venice of America. We where contacted by the property manager of a community in Lauderhill, FL. The whole unit had mold, especially the bathroom ceiling. We used an air scrubber during work, hepa vacuum and wiped down with anti fungal. After mold was removed, air ducts where cleaned with a jet filter. 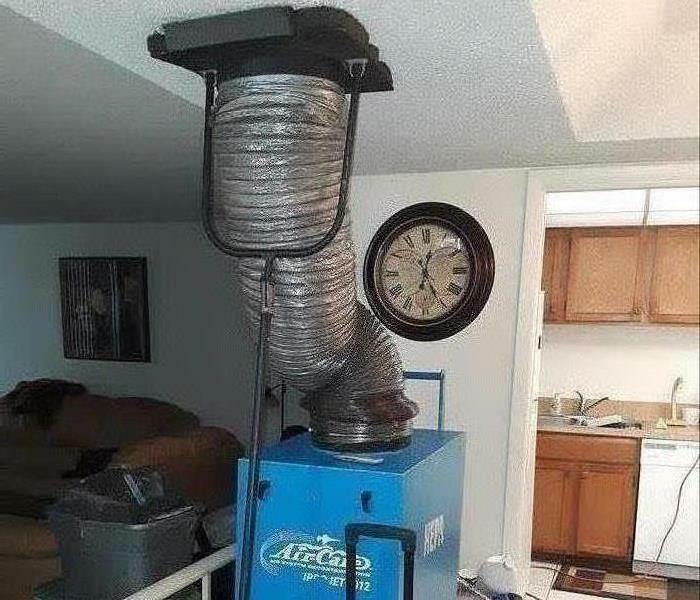 After a mold job we recommend cleaning your air ducts. If you would like a free estimate for duct cleaning or have mold contact us at (954)748-7887. We proudly serve the Sunrise, Lauderhill, Tamarac and surrounding areas. 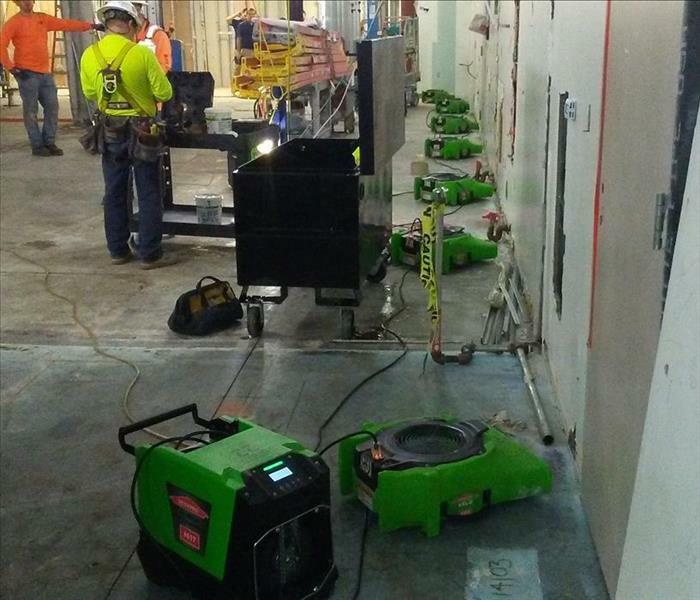 SERVPRO of Sunrise was called by the subcontractor that was doing work at the Cleveland Clinic in Weston, FL. This was an emergency call during business hours, we extracted water using a rover. Air movers and dehumidifiers where also used to help the drying process. In a couple of day's it was all dry "Like it never even happened" we are happy to help our customers and take all the stress away! 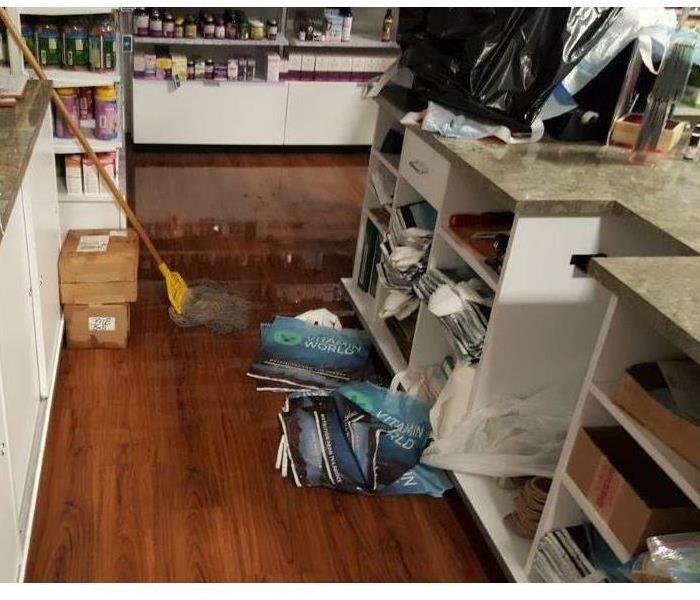 If you have an emergency due to water damage, fire damage or mold contact us 24/7 at (954)748-7887. We proudly serve the Sunrise, Tamarac, Sawgrass Mills and surrounding areas. Gustavo showing a property manager near the Sawgrass Mall, FL images on the in Thermo Hygrometer Moisture Meter. Thermo Hygrometer are useful for measurement of humidity. We proudly serve the sawgrass mills, tamarac, lauderhill and surrounding areas. 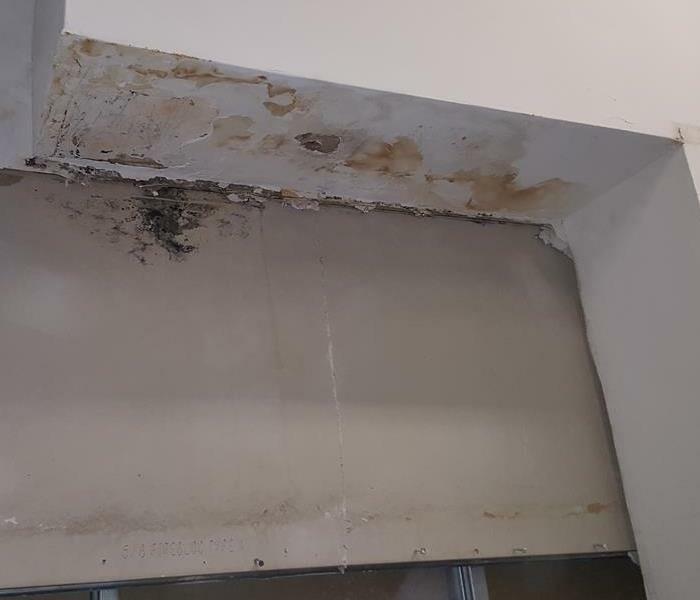 Hassan in a commercial water damage in a building in Tamarac, Florida. Following the SERVPRO water damage guidelines. 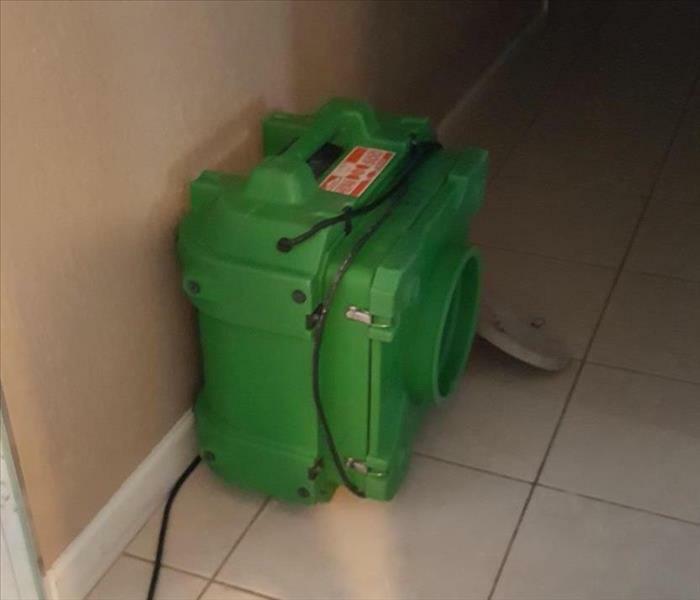 We make water damages "Like it never even happened"
After the first wave of heroes have rescued the property, our SERVPRO of Sunrise crew is ready to help restore it. 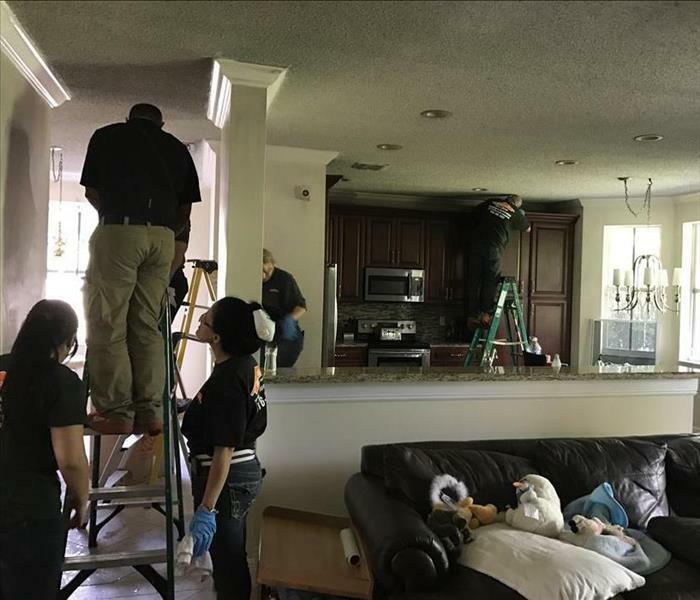 With the industry-approved training to employ rapid response, the utmost professionalism, cutting-edge technology and open communication, we strive to restore not only the home, but the customer's peace of mind, as well. From left to right: Jennifer-Marketing Rep, Gustavo-Production Manager/Owner, Joanna-Production Assistant, Ana-Manager/Owner, Natasha-Office Assistant, Diana-Accountant. Thankful for this amazing team! From left to right. Natasha, Joanna, Rey, Jose, Ana, Hassan, Luis, Jennifer and Gustavo. October 11th, 2018 at the State of Latinos in Sunrise event that took place in Metropica. From right to left; Ana Owner/President of SERVPRO of Sunrise, Mayor of Sunrise Michael J. Ryan & his wife. Its always fun to have Blaine visit us from corporate. We all wish you the best!!!!!!! 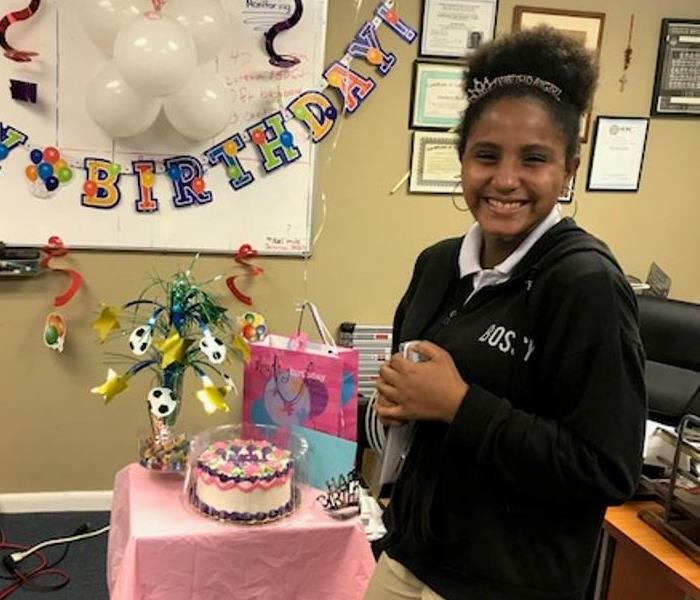 This is Maleah on her 13th Birthday, she is the daughter of Joanna our Production Assistant. 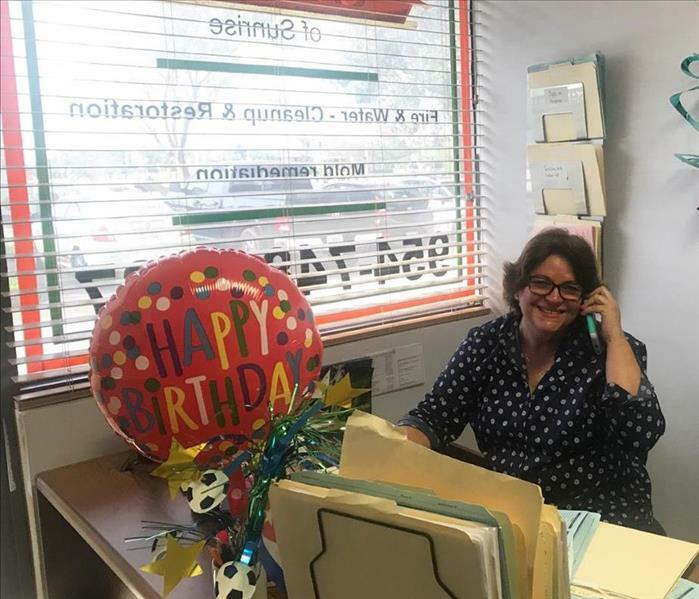 All of us from SERVPRO of Sunrise wish you a very Happy Birthday! SERVPRO of Sunrise attending CAI monthly breakfast meeting about Managers Budget Season at the Jacaranda Country Club in Plantation, Florida. 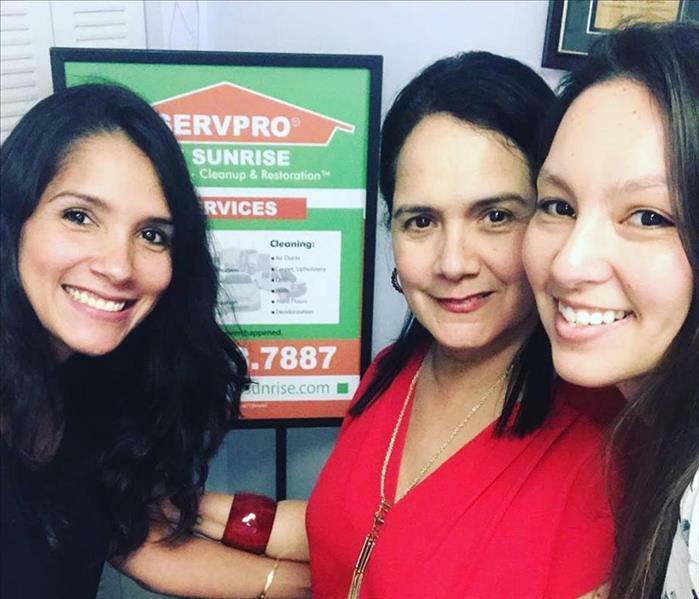 Jill Proietti CAI Executive Director with SERVPRO of Sunrise owner Anamilena Diaz Granados and Business Development Manager Jennifer Torres. SERVPRO Summer Area Meeting 2018. Always learning! On August 20th we celebrated Luis birthday, Wishing you joy and happiness always!!! 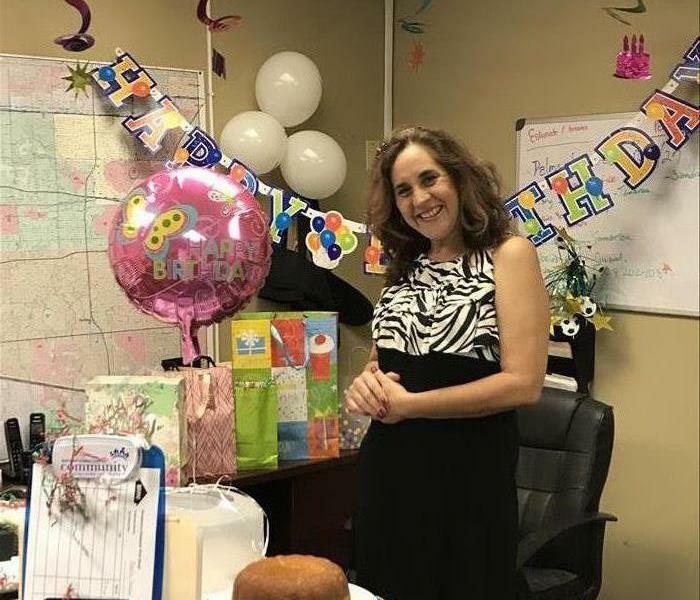 Today, July 3rd SERVPRO of Sunrise family came together for lunch to celebrate Natasha's Bday, she is our office assistant. We wish you a very Happy Birthday! We had an amazing time at the 49th Annual Convention. This was the opening night in Orlando, FL. On May 11th we celebrated our Production Assistants Birthday! Happy Birthday Joanna!!!! 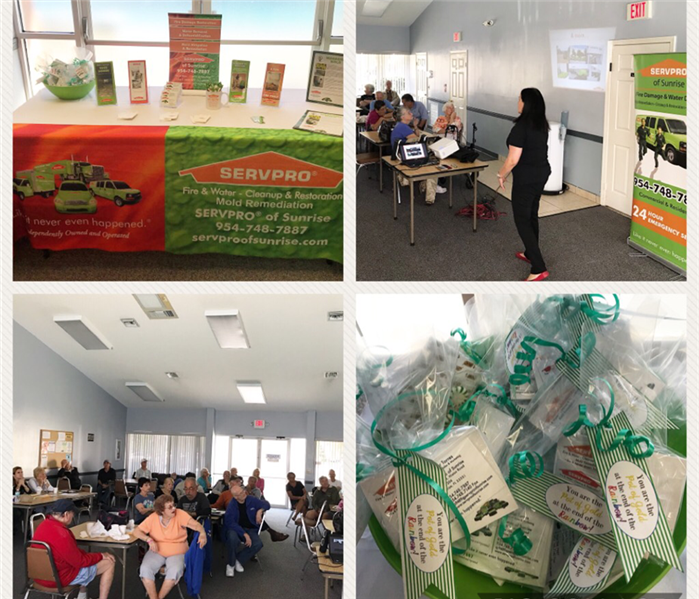 SERVPRO of Sunrise attended and participated in the training Area Meeting that took place Thursday April 26, 2018 in Deerfield Beach, Fl. Great topics like WIG's, Commercial Fire, Workcenter Office, Storm, Job flow among other interesting themes. Owner Gustavo and Office Production Assistant attended the event. Life should not only be lived, it should be celebrated!!! 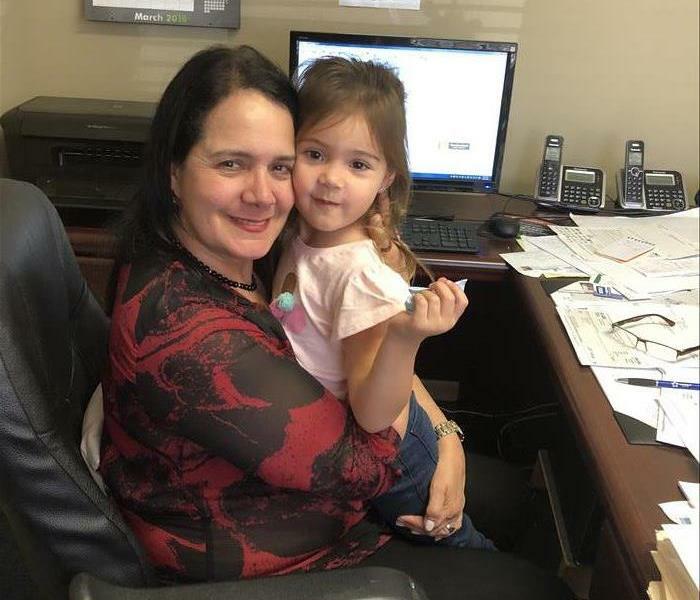 Here is Ana and her youngest granddaughter Paris working hard on this Spring Break. Lunch and Learn with building captains in Sunrise, FL. Thank you Realty World for the invitation to participate as an EXHIBITOR in this great event! 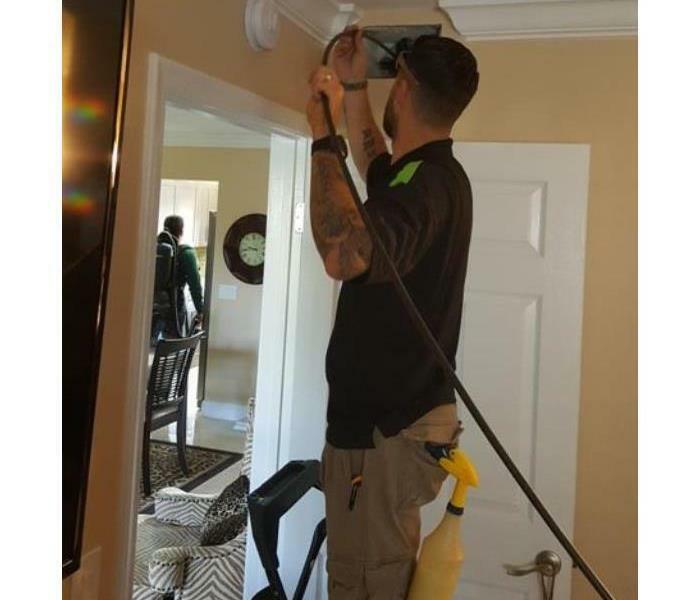 Homes and business can depend on SERVPRO of Sunrise to clean and sanitize building materials, surfaces and contents following restoration industry standards, using professional cleaning products and EPA- registered cleaners and disinfectants. Happy Birthday to our marketing director Jennifer. We wish her the best and many more. Thank you for being apart of our team. Happy Birthday Gustavo!!! We had a nice celebration with our SERVPRO of Sunrise Team! We at SERVPRO of Sunrise were ecstatic to present a new van as an early Christmas gift to our crew. What a way to enter Christmas and end out the year. At SE-Fl Community Association CE Networking breakfast at the Jacaranda Country Club. In the photo with Jill the Executive Director of CAI and marketing representative for Rainbow Roofing. 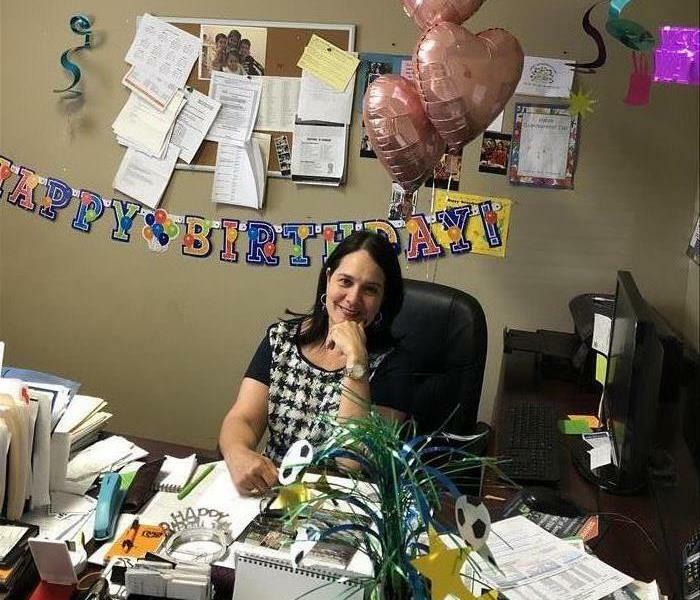 We want to wish a Happy Birthday to our office assistant Isabel!!! We are celebrating at our office that finally has power after 8 days without do to Hurricane Irma. Great presentation of A Clean House Sells Faster presented by Ana, to all the agents at RE/MAX InterAction Realty in Tamarac, FL on July 2017. 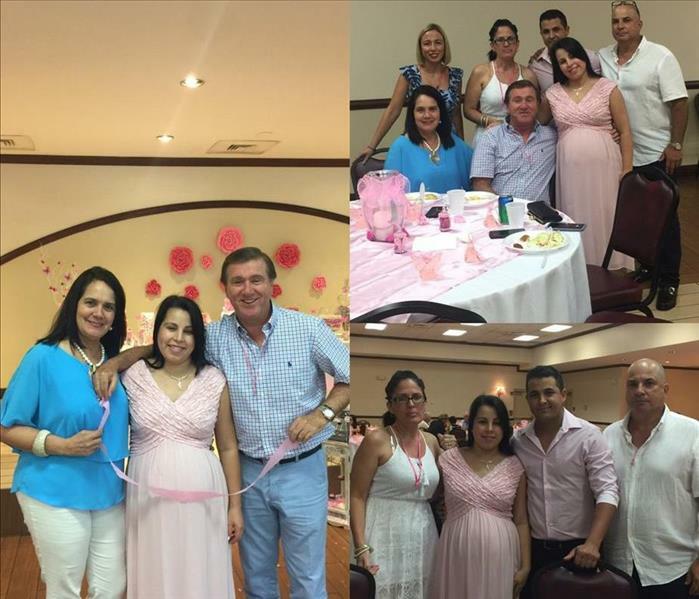 This weekend we where invited to celebrate with Hassan our tech and his wife the baby shower of their baby girl that is expected to arrive in September. We can't wait to meet her! 10 Years of Service in the SERVPRO Family! SERVPRO Industries Proudly Recognizes Gustavo A Daza nd Ana Milena Diaz Granados, 10 Years of Service in the SERVPRO Family! We are very proud and thank our Team members, our loyal customers and our family for their trust and support. Real Estate Lunch & Learn! This year marks SERVPRO's 48th annual convention! It was held in Seattle, Washington from June 24-28, 2017. Ana was very happy to be able to attend this year's convention. 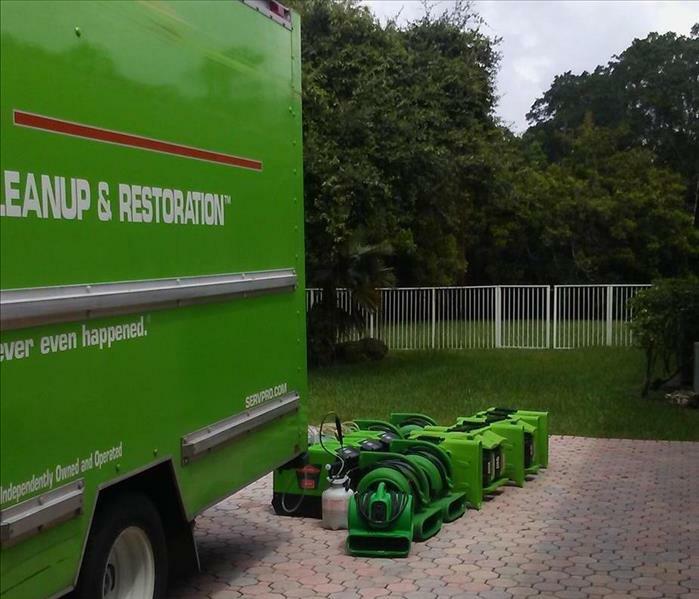 SERVPRO of Sunrise green truck at a customer house in Windmill Ranches in Weston, Florida getting ready with our dehumidifiers and air movers for the water damage remediation process. 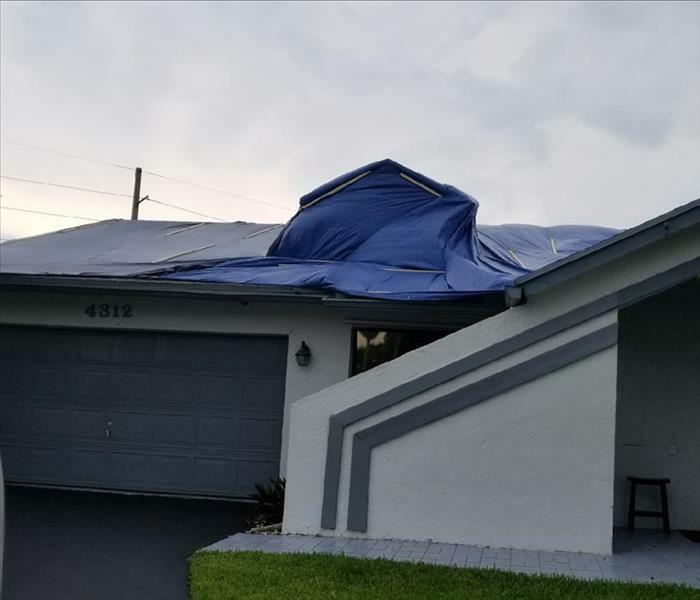 This roof of a home in Plantation, FL had severe water damage due to the excessive rain we've had in South Florida this past week. We use scientific drying principles and provide validation and documentation that your property is dry and the job is complete. There is no doubt the rainy season is here! 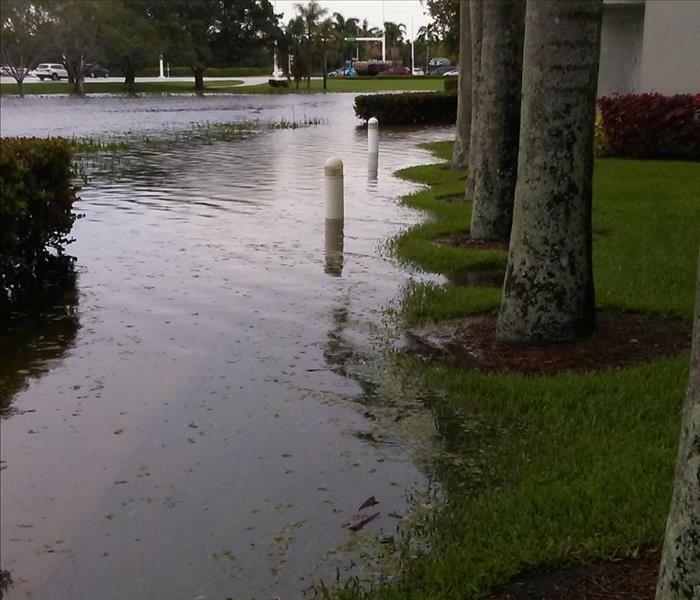 We've had record rainfall for the first week of June, which caused the flooding of Ultimate Software offices in Weston, FL. When a storm hits your home or business, you need help immediately. Our quick response will help prevent secondary damage and help reduce restoration costs. When you need it done right and done fast, call SERVPRO of Sunrise for all you commercial cleaning & restoration needs. Because when you experience a fire, water or mold damage in your facility, you need fast response and the expertise to get the job done right, ensuring your business can get back into operation as quickly as possible. Gustavo our owner and Production Manager with the Insurance Adjuster looking at a recent house fire. The customer thank God has a homeowner insurance policy. The car got in fire in the three car house garage. Every one in the house did not suffer any harm including their three pets, but a lot of dwelling and contents damages. SERVPRO of Sunrise is in the job starting the Fire Damage Restoration. Mold Completely took over this bathroom! 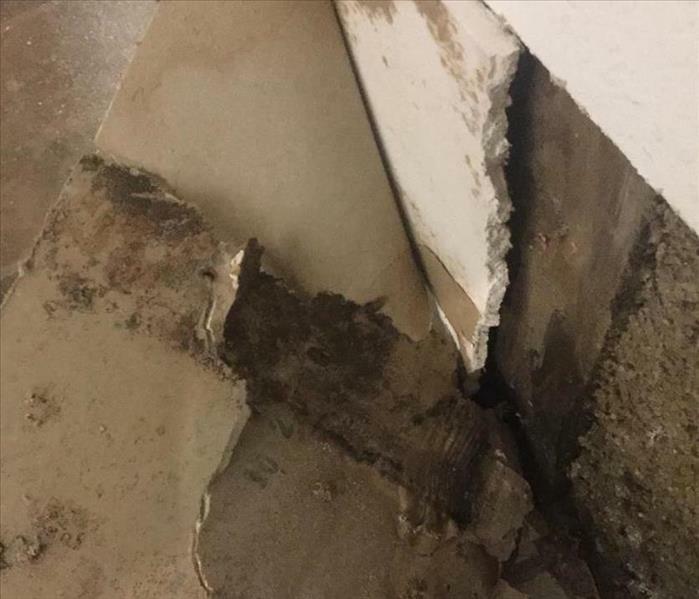 SERVPRO of Sunrise Professionals handle water damages every day and we know prompt action is required to prevent mold growth. Mold is more likely to spread when an environment has been subject to moisture for a long period of time. If you think you might have a mold problem call us at 954-748-7887 for a free visual inspection! 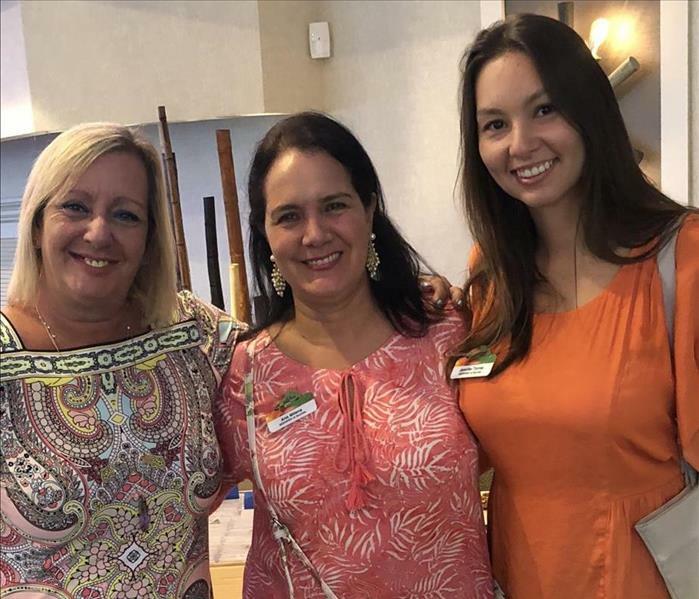 The Broward Coalition is South Florida's Premier Community Association and meets the second Friday of every month at the Sunrise Lakes Clubhouse Phase 4 in Sunrise, Florida. SERVPRO of Sunrise is on of the business partners of the group. This photo shows Mary Macfie the 1st Vice President with Ana our owner at the last meeting before the summer break. In some circumstances, such as after fire, smoke or suspected mold growth, duct cleaning becomes an essential part of the cleanup process. SERVPRO of Sunrise can often restore the HVAC system and ductwork to pre-damage condition. 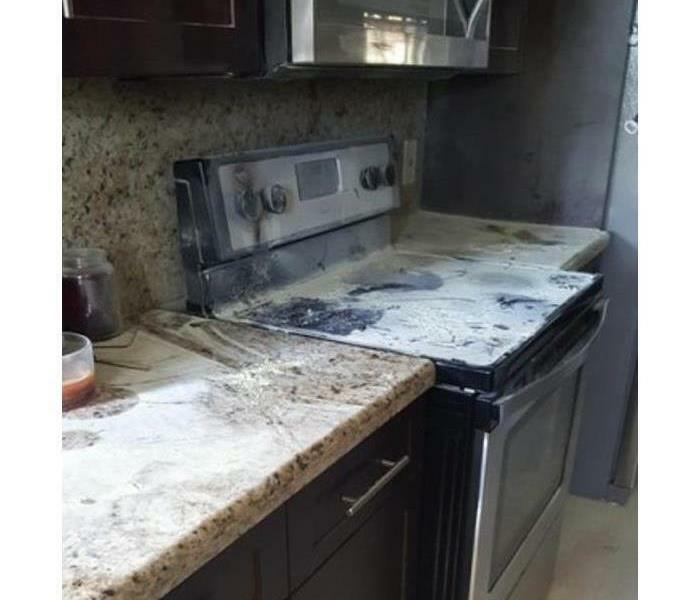 This is a kitchen that caught fire at a condo in Pembroke Pines, FL. The first 48 hours after a fire damage can make the difference between restoring versus replacing your property and personal belongings. SERVPRO of Sunrise timely response help ensure to restore preloss condition of your property and belongings. This is the entrance of what use to be the play room in a home in Weston, FL. There was significant smoke and soot damage. Our SERVPRO of Sunrise crew worked quickly to restore this home and make it "Like it never even happened." 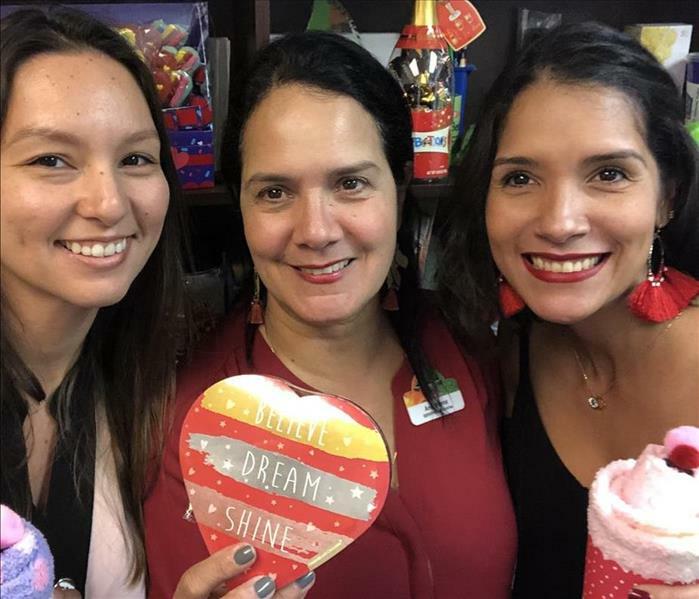 Today June 5th, at Silver Palms Elementary School in Pembroke Pines, Florida, our SMR - Director of Sales and Marketing Jennifer Torres as a proud parent of Isabella was with her receiving her consecutive Honor Roll for the past two years. Great job Isa and we are honored and happy to share this photo of Jen and Isa! Piper High School Dress for Sucess! Manager at a Fire Inspection ! Our production manager Gustavo in a Sunday morning inspecting a residential fire that occurred in a house in Weston, Florida at the middle of the night. Owner showed all the damage and areas affected, caused by a fire that started in their son's game room. 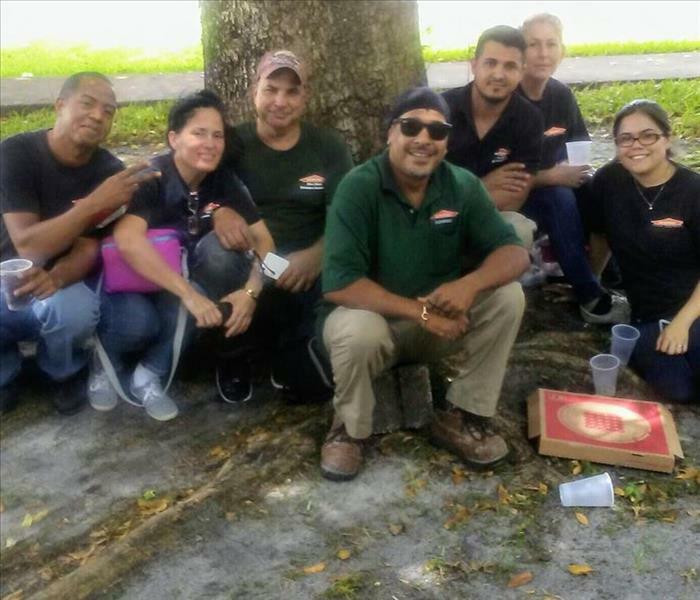 One of our SERVPRO of Sunrise crews in this photo in their lunch break while cleaning a house fire in Weston, Florida. A two story residential house affected during a weekend with lots of smoke and soot. They did a great fire cleaning job. Mold present behind wall in dinning area, adjacent to a bedroom. Recommendation to seal of dinning area from living room area & entry to kitchen, remove baseboards & 2ft of sheetrock from affected wall in dinning area and bedroom. Bio treat structure & hepa vacuum affected areas & wipe down dinning area and kitchen. This mold job was performed in a house in Tamarac on May 2017. 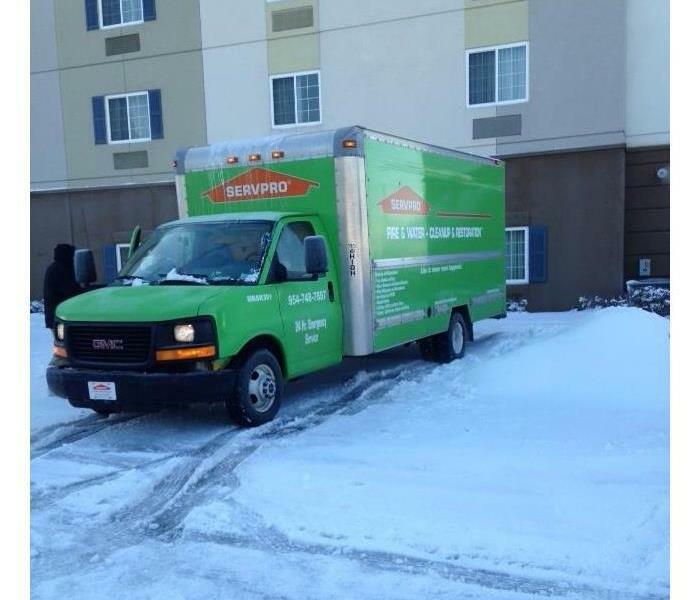 Our SERVPRO of Sunrise GMC truck full of snow after a long drive from Florida to Georgia to help a SERVPRO franchise in the Polar Vortex storm situation. Several water damages were performed by our crews. Our crew chief Mike on top of one of our weighted extraction machines called Rover doing a commercial water damage job. 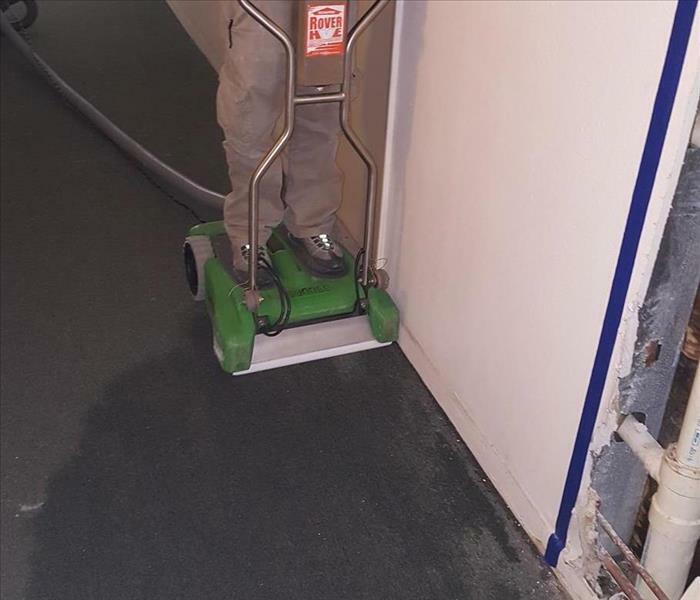 He is extracting water from a hallway carpet in a building condominium. 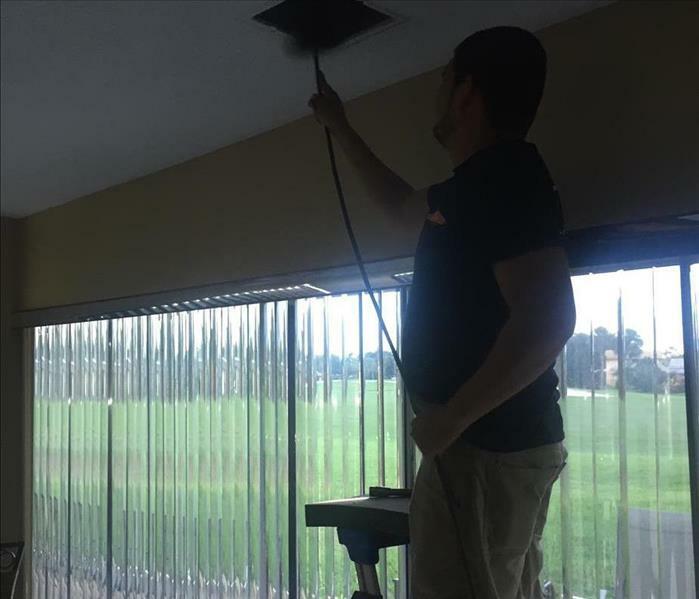 Ferley one of our SERVPRO of Sunrise Team supervisors doing a Air Duct Cleaning in a commercial facility. Beautiful snow storm street view from our SERVPRO of Sunrise hotel room. Early morning in January while waiting to go out the street to do some water damage jobs with a fellow SERVPRO franchise in Virginia. 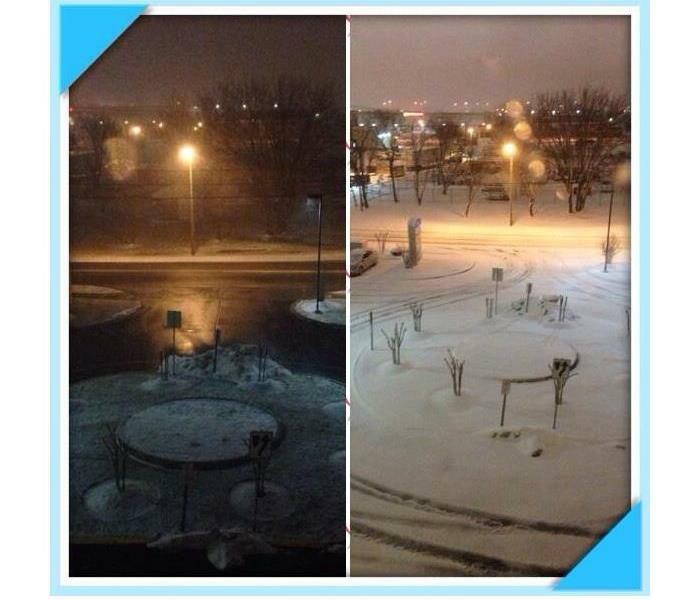 Our SERVPRO of Sunrise Team while working and helping a local SERVPRO franchise in Virginia Beach, VA woke up in the morning before hitting the road to work and saw this beautiful but scary snow view. While driving to a storm our team saw the sky like if a Tornado was coming soon. 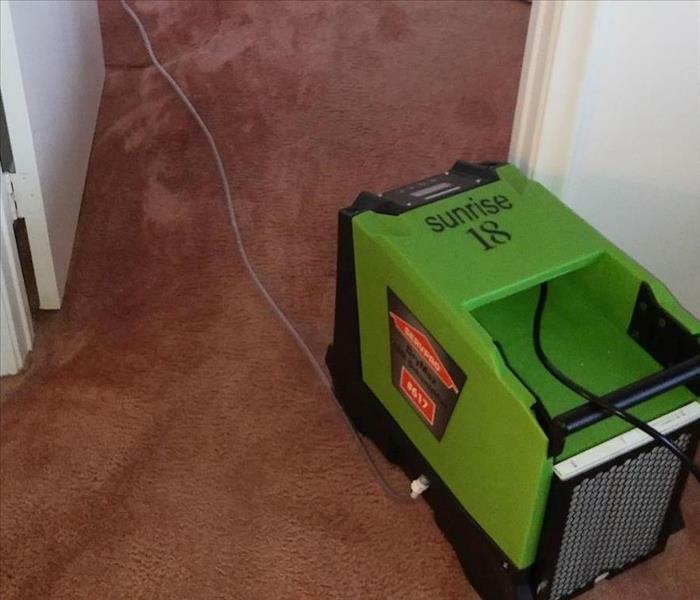 SERVPRO of Sunrise Faster to any Size Disaster! 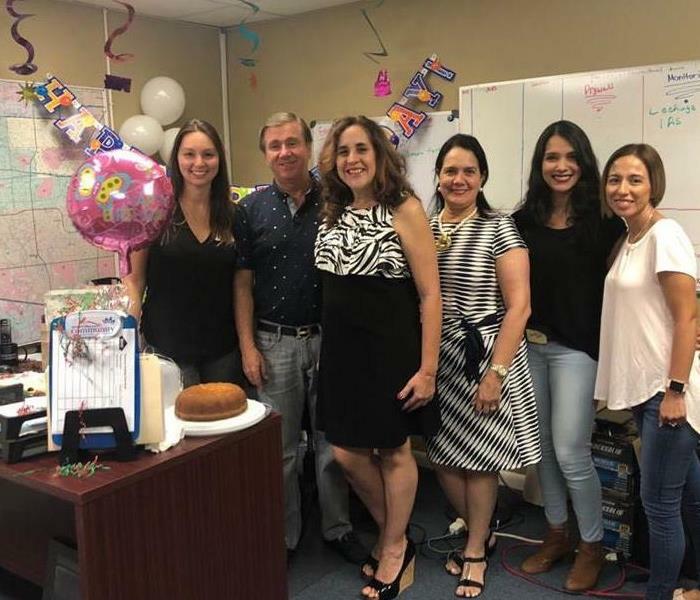 We celebrated owner Ana Milena's birthday at our office. We enjoyed the event with a birthday cake, ballons, birthday card including a gift card from all SERVPRO of Sunrise Team! Two of her grandkids came and visited and sang the happy birthday with all of us! SERVPRO of Sunrise crew about to start a fire cleanup in a residential home. A fire can strike at any time! Thankfully nobody was hurt. SERVPRO of Sunrise is the local leader in fire cleanup and restoration. Once we're done, it will be "Like it never even happened." Hassan one of our Technicians doing decorations in our SERVPRO of Sunrise office. Hassan not only performs his daily routine jobs very good but is always willing to help in different chores and activities different from his production responsibilities. Hassan is a young man with a great sense of humor, always smiling and happy. The annual Golf Tournament hosted by SE Florida Chapter of CAI - Community Association Institute took place again at the Jacaranda Country Club in Plantation, Fl. SERVPRO of Sunrise sponsored a tee hole in order to help with the non profit organization to be honored ' A Safe Heaven for Newborns". One of SERVPRO of Sunrise crews working in a house in Weston where a sudden fire in the middle of the night started in the kids game room in the first floor. All areas of the residence where affected. All SERVPRO and SERVPRO of Sunrise equipment are green. Green means Clean! 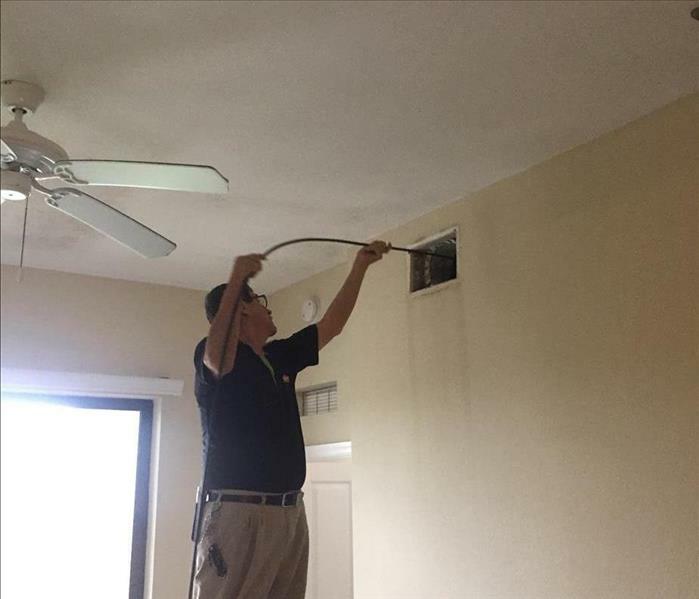 Air Movers, Axial Fans, Dehumidifiers, Air Scrubbers, Vacuums among others are some of the equipment used for Mold Remediation, Water Damages, Fire and Carpet cleaning. Keeping the HVAC system and ductwork clean can potentially extend the life span of the equipment by allowing it to operate at peak condition, which may save you money and breathe in a nice environment. Jennifer is our new marketing and business development person. She is also a Realtor and experienced social media person. Photo taken in the Network Professional group were SERVPRO of Sunrise has been a member for several years. Welcome Jen to our SERVPRO family! 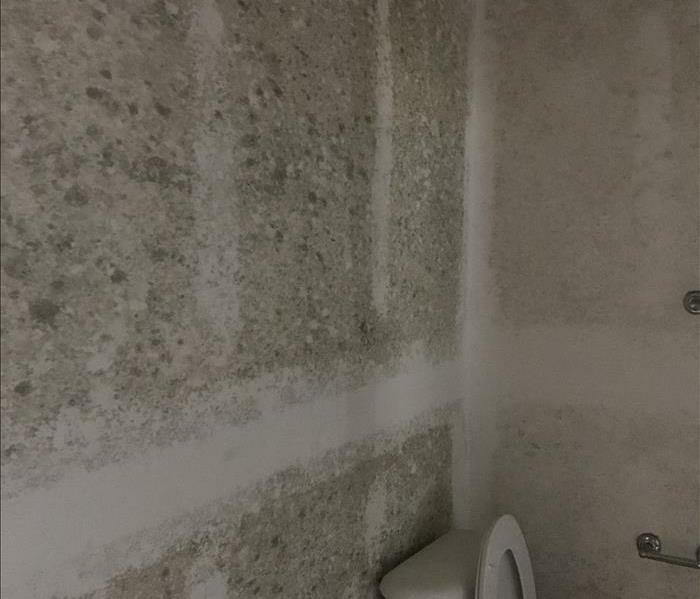 Mold issues in the bathroom of an apartment in Sunrise, Florida. As certified Mold Remediators we addressed the mold damage as per IICRC standards. 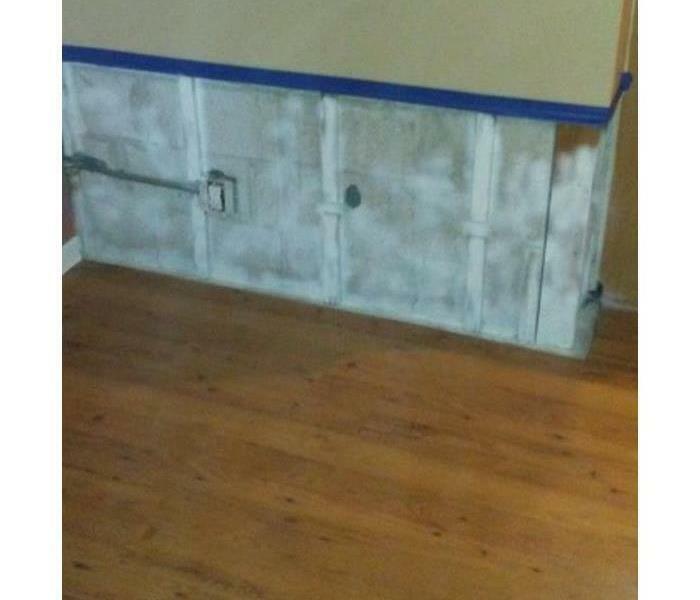 Drywall was removed, antimicrobial solutions were applied, air scrubbers were used before drywall was replaced. 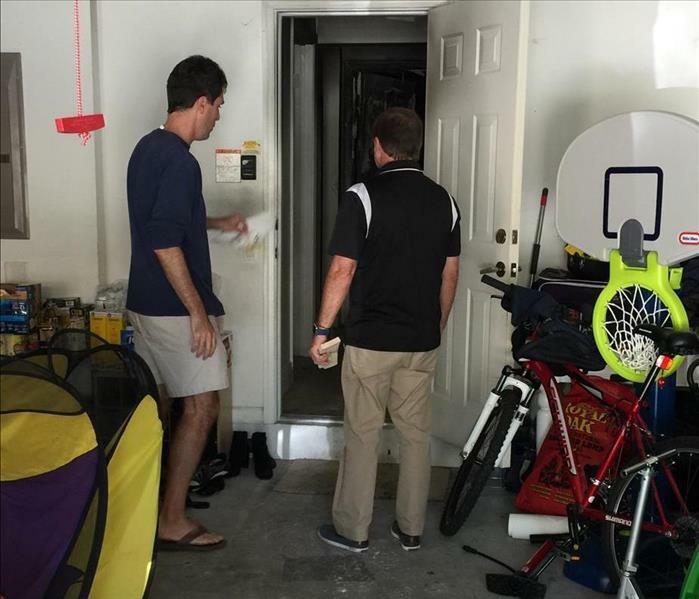 Water damage in a condo unit in Pembroke Pines, Florida. It was because of an improper installation of the washing machine that caused a water damage in the middle of the night. Carpet was soaked. We said goodbye to a nice and experience member of our SERVPRO of Sunrise Team! We wish Mike luck and the best in his new future. We will miss him. Our office assistant had the great idea of bringing green decorations, like green hats, necklace and bows in order to have our crew get the green spirit and be greener St Patrick's Day. The best was the decoration of one of our Air Movers with a green bow. We had a blast. Our SERVPRO trainer, Blaine Armstrong, visited our office on March 3rd. He met with Production Manager, Crew Chief, Techs and Office assistant in a very productive production meeting. Among other things they discussed Office Work-Center, jobs auditing and marketing. Mike our crew chief at a commercial water damage job in a building in Coral springs, Florida. He was using our Rover for water extraction. SERVPRO of Sunrise owners, Gustavo Daza and Anamilena Diaz Granados spent Friday morning of 02/03/17 with two of their grand kids celebrating Grandparents' Day at the school. It was an emotional and happy event to see the grandparents of all the PreK and 1st grade students. Our owner Ana and marketing manager attended on 01/17/2017 the invitation of EWM International Realty of Weston, Florida to participate with 25 more vendors in their first Real Estate Vendor Showcase. It was a great event were we met around 50 realtors and had the opportunity to talk about the services provided by SERVPRO of Sunrise. On Saturday , January 14 was Gustavo's birthday party with family and friends. He's a family guy and love to spend time with his grandkids surprise him with a delicious chocolate cake decorated by them. He had a very special birthday. On Friday the 13th , We decided to surprise Gustavo our Production Manager for his birthday with balloons ,cake and decoration. Once he opened the door we all yelled HAPPY Birthday!! He was very surprised and grateful. Andres and Hassan were the tech who decorated the office for Gustavo Daza , owner of SERVPRO of Sunrise, on his birthday! They did a great job Thank you guys ! Photo of Mayor Michael Ryan and SERVPRO of Sunrise owner, Ana M Diaz Granados. Also in the pic Fire Chief Thomas Di Bernardo and Executive Director of the SCC, Louis Feurer. We celebrated our crew chief Mike Chatman birthday at our SERVPRO of Sunrise office in Sunrise on December 23, 2016. Mike was very happy, received gifts and we all went after to celebrate with a very nice lunch. 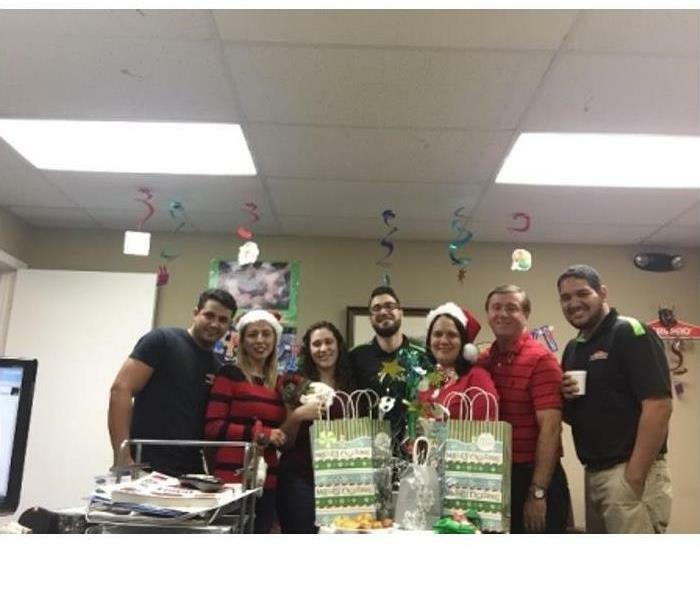 We met at our SERVPRO of Sunrise office to celebrate and gather to share Christmas gifts to crew members and staff. That same was the brithday of our our crew chief Mike Chatman! We had double celebration! Cheers! What's christmas without a gift. So here is Gus & Ana with something special for us !It's the warmest, biggest , tightest hug... Wrapped up with all our love to the great Staff! 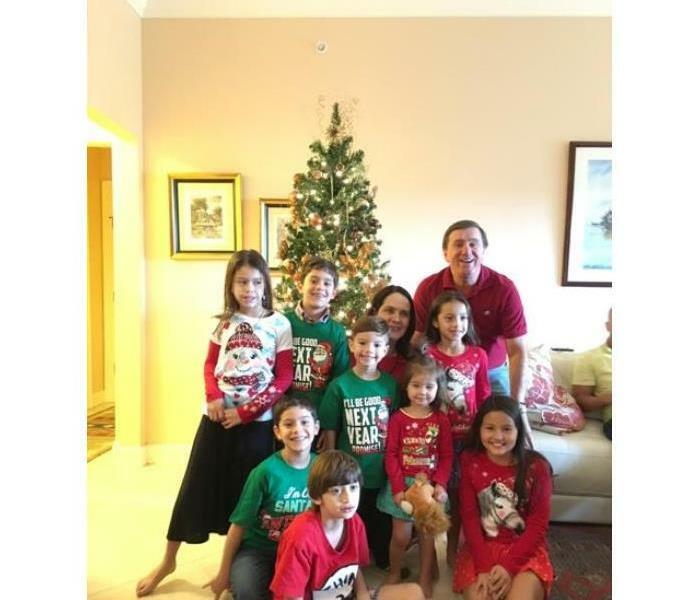 A Christmas Gathering with all the GrandKids ! Every year on the second Sunday of December we do a family gathering with all the grandkids, to celebrate family and to cheer for all the blessings we received all year! We encourage our community to do the same and spent time with your loved ones.Celebrate laughter and hope. From my Family to your family Happy Holidays !! SERVPRO of SUNRISE 24/7 Water & Fire clean up and Restoration. The Greater Sunrise Chamber of Commerce Holiday breakfast was at Springtree Golf Club in Sunrise, Florida. The event was hosted by AMLI Sawgrass Village and Insure-Link; both great companies member of the chamber. SERVPRO field trainer Blaine Armstrong with our office admin Lili Esper. They made a good connection when Blaine visited our SERVPRO of Sunrise for the first time today. We are pleased and happy to have him as our SE Florida trainer. We welcome our new SERVPRO trainer, Blaine Armstrong. He came for the first time to visit our SERVPRO of Sunrise office. Blaine is very knowledgeable and experienced in business development, consultation and management. Our owners Gustavo Daza and Ana M Diaz Granados are celebrating today their 41st wedding anniversary. 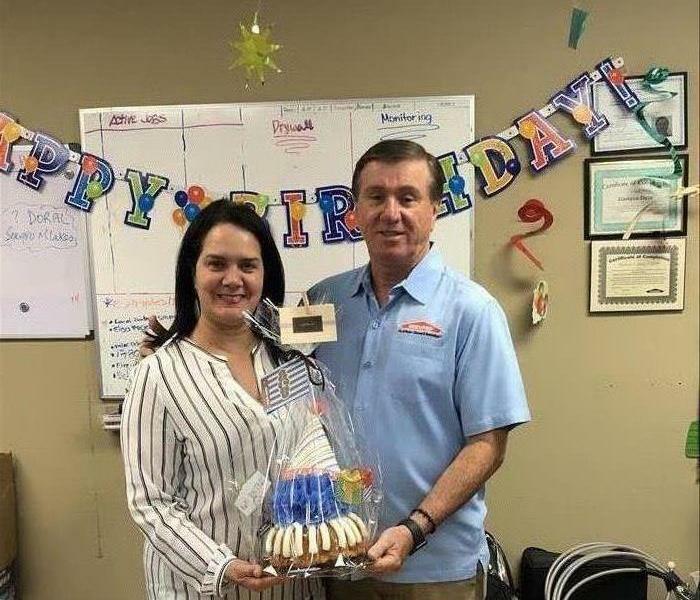 All SERVPRO of Sunrise team wishes them the best and many more years together. Happy Anniversary from all of us! 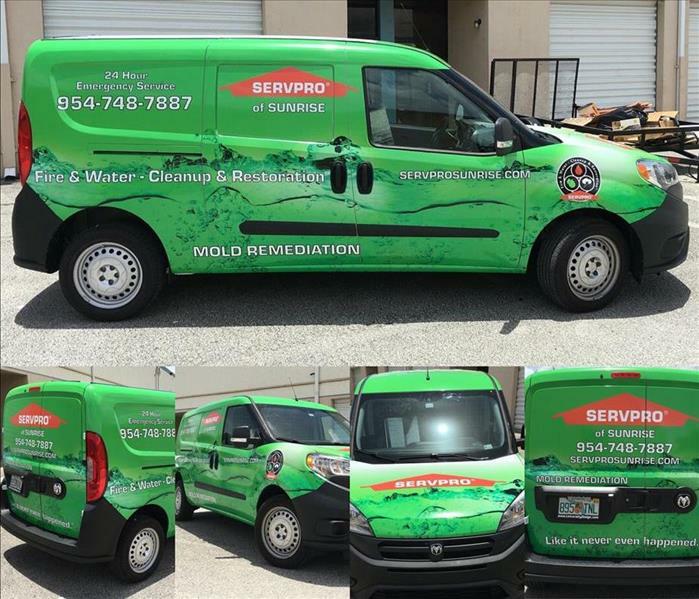 "SERVPRO of Sunrise Has Expanded Our Fleet." Our SERVPRO of Sunrise Team doing a water a damage. We have expanded our fleet so that we can respond more quickly to your restoration emergency. We respond 24/7/265 to your fire, water, and mold damage cleanup needs." Happy thanksgiving from SERVPRO of Sunrise Team!! Hope that you're surrounded with the love of your family and dear ones on this festive season. Happy Thanksgiving to you and your family. 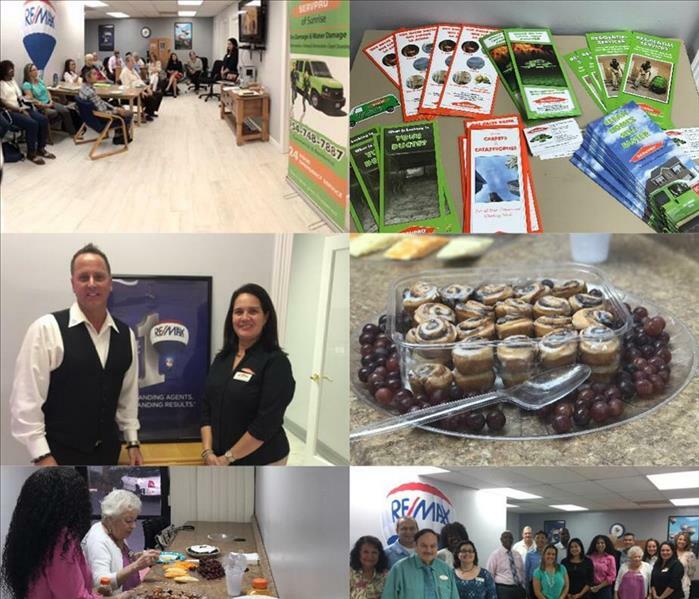 Great Presentation from SERVPRO of Sunrise at Realty Word, Weston, FL 33326. SERVPRO of Sunrise helps agents to sell or rent properties more easily, helping them to solve issues caused by previous water damages, mold or even fire damage. That may have been found while inspecting the property. We have a great Continued Education at Associate Management Company. The Property managers gains a better understanding of what to expect from a good restoration professional. 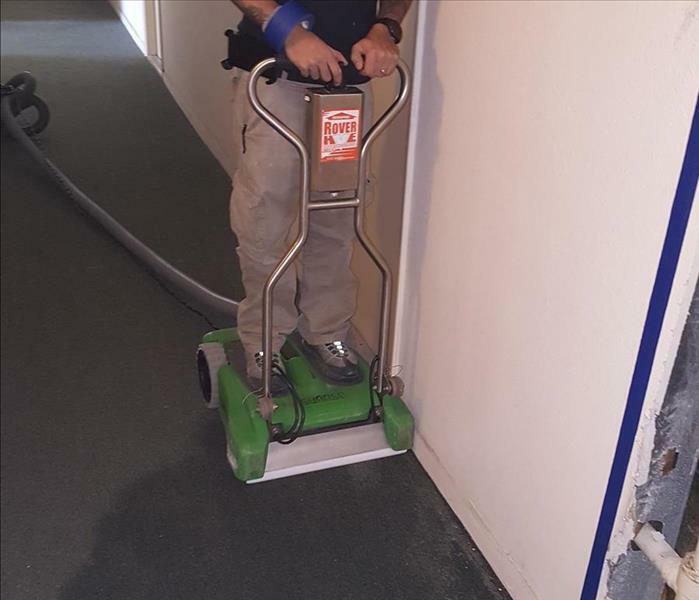 They learn the principles of water damage restoration as defined in the Industry standards. E Management learned the key questions a restoration professional asks when inspecting and drying water damaged properties. We enjoyed taking Halloween photos in our SERVPRO of Sunrise office on Halloween day with owner Anamilena Diaz Granados and Admin assistant Lilibeth Esper, all dressed in black with the same orange witch necklace. Is good to take a few minutes of our daily routines to smile! 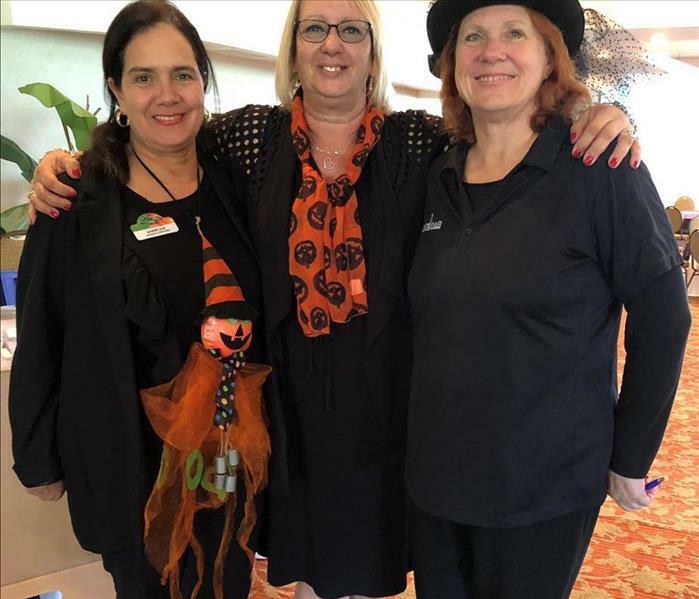 Owner Anamilena took the time to do Halloween marketing visits October 31,2016 with Property Managers John from Lakes of Carriage Hills in Tamarac, Florida and Janet from Environ Condominiums in Lauderhill, Florida. Usually every Halloween day they and all the office staff dress out very nice and cute. We thank them for all the work and trust for many years with SERVPRO of Sunrise. 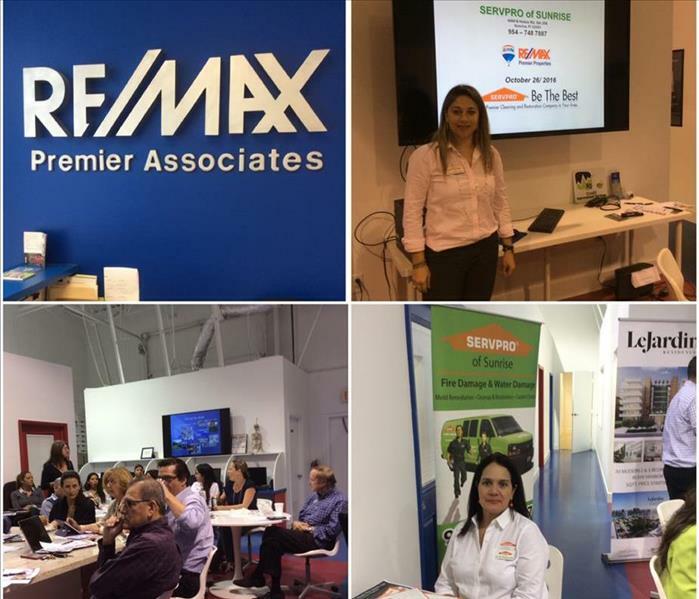 Great Presentation from SERVPRO of Sunrise at RE/MAX Premier Associates, Weston, FL 33326. SERVPRO of Sunrise helps to the agents sell or rent properties more easily, helping them to solve mold, water or fire damage. The Southeast Florida Chapter of CAI will hold its 2016 ANNUAL EXPO at Gulfstream Park Spot of Kings Room in Hallandale. CEU's for managers. A portion of the proceeds will be donated to The Florida Initiative for Suicide Prevention. SERVPRO of Sunrise attending Sunrise Business Heroes at The Greater Sunrise Chamber of Commerce. Laurie Jennings (Channel 10), Anamilena Diazgrandos Mayor Mike Ryan, Luis Feuer. Nice networking event Vendor Trade Show on Tuesday, October 25th from 10:00 to 12:00. at Coldwell Banker. SERVPRO of Sunrise provide Gift card donation to a member of staff. Great presentation this week from SERVPRO of Sunrise at Rick Case Honda Weston. ABN- Americas Business Networking. Meet new people and promote your business every wedenesday from 7:45 am to 9:30 am. 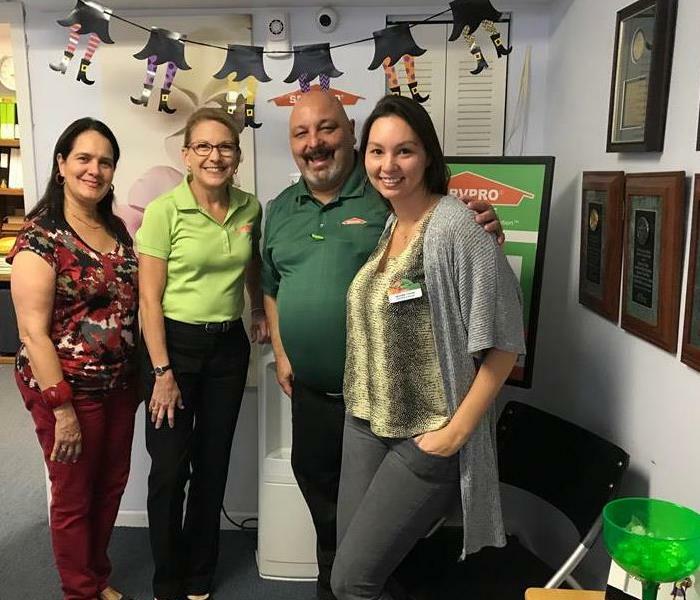 SERVPRO OF Sunrise Team got together to wish FERLEY MARTINEZ A GREAT BIRTHDAY AND GOOD RETIREMENT. He was part for our production team for 8 years. We will miss him for his hard work, personality and commitment. Best luck to Ferley from all of us. 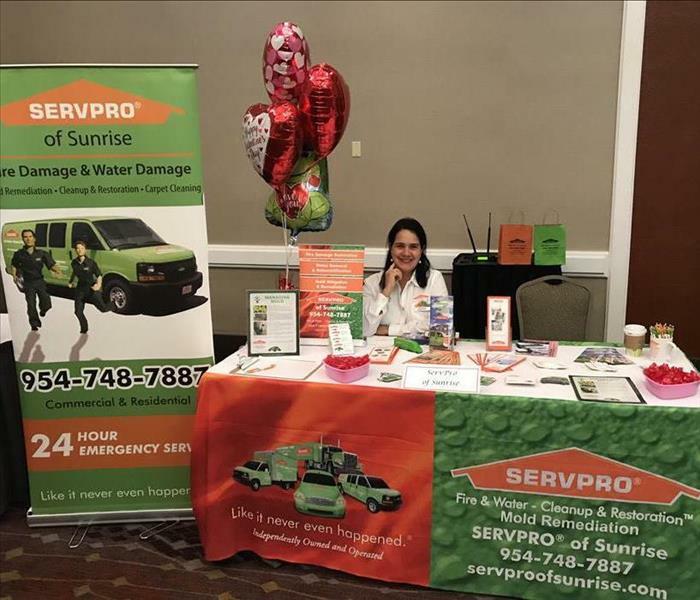 SERVPRO of Sunrise provided very important information to the community on how to be prepared if something sudden happens like water damage and fire. "Ready for Whatever Happens"
Awesome Christmas Lunch. SERVPRO Of Sunrise Team. 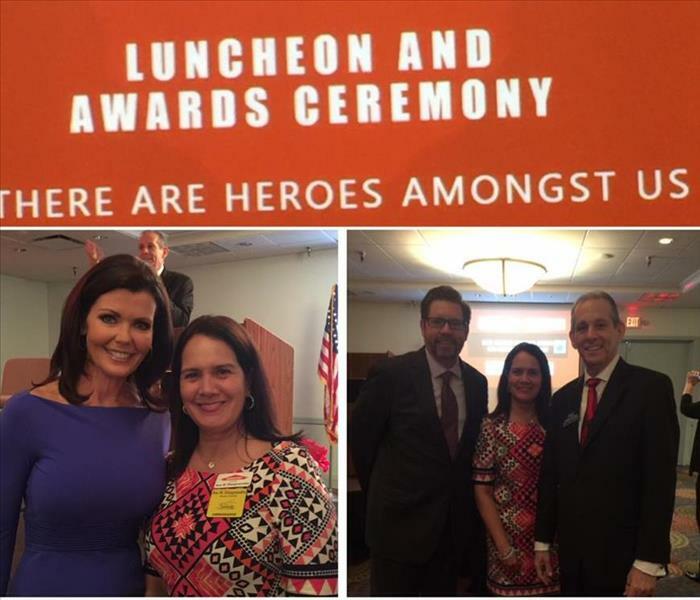 SERVPRO of Sunrise Production Heroes by The Greater Sunrise Chamber of Commerce, October 16, 2015. Award given by Mayor Michael Ryan from City of Sunrise.